What is Wellness Kit For Dogs? The 1-800-PetMeds Wellness Kit for Dogs is a four-in-one package of healthy items for your dog at an incredible savings! The kit includes one 18 oz-bottle of Oatmeal & Aloe Vera Shampoo, one 60-count package of VitaChews for Dogs, one 60-count package of Breath Refresher Chews for Dogs, and one 16 oz-bottle of Ear Cleansing Solution. The 1-800-PetMeds Wellness Kit for Dogs is approximately a $39 dollar value for only $24.96, a 35% savings! 1-800-PetMeds Oatmeal & Aloe Vera Shampoo gently cleans your dog's coat. The Oatmeal and Aloe Vera Shampoo will not remove topical flea and tick medications, but will clean debris and soothe the skin.1-800-PetMeds Breath Refresher Chews are formulated with mint and peppermint to tackle doggie breath. For your dog's ears, 1-800-PetMeds Ear Cleansing Solution cleans, acidifies (killing bacteria, yeast and fungus) and deodorizes. For the whole body, there's the vitamin and mineral supplement 1-800-PetMeds VitaChews. Click below to see information on each product. 1-800-PetMeds Oatmeal & Aloe Vera Shampoo: Using warm water, wet your pet's coat thoroughly. Avoid contact of soapsuds with eyes. Apply shampoo from tail to head and gently massage deep into coat and skin. Rinse thoroughly. Repeat process. Allow your pet to stay indoors until dry. 1-800-PetMeds Ear Cleansing Solution: Apply generously but carefully to the ear canal. Gently massage the base of the ear. Allow pet to shake head, then clean excess with a cotton ball. For very dirty ears, apply 2 or 3 times daily for several days. 1-800-PetMeds Vitachews: For dogs under 20 lbs, give 1/2 tablet daily. For dogs over 20 lbs, give 1 tablet daily. 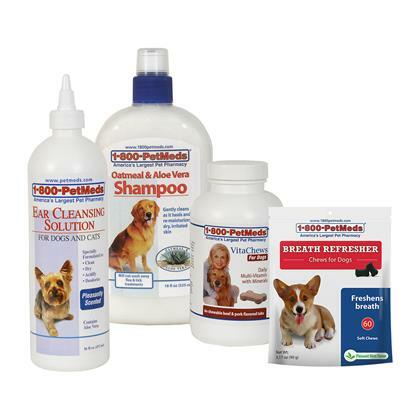 1-800-PetMeds Breath Refresher Chews: For dogs under 20 lbs, give 1 chew daily as needed. For dogs over 20 lbs, give 2 chews daily as needed. 1-800-PetMeds VitaChews is ideal for all dogs, but is especially beneficial for mature and aging dogs because it is loaded with vitamins, minerals, and antioxidants. Other ingredients: Oat flour, rye flour, brewers dried yeast, glycerin, parsley powder, algae whole meal, arabic gum, soy lecithin, water, maltodextrin, sodium alginate, calcium sulfate, citrus pectin, sorbic acid (a preservative), parsley seed oil, propionic acid (a preservative), mixed tocopherols (a preservative), peppermint oil, mint flavor, papain*Not recognized as an essential nutrient by the AAFCO Dog Nutrient Profiles.1 One USP Unit of Papain activity is the activity that releases the equivalent of 1 ug of tyrosine from a specified casein substrate under the condition of the assay. This product contains sources of Papain (hydrolyzes protein). Calorie Content (calculated ME): 3245 kcal/kg, 9.7 kcal/tablet. Ingredients: Microcrystalline Cellulose, Dicalcium Phosphate, Glucose, Dried Chicken Liver, Sucrose, Brewers Dried Yeast, Stearic Acid, Choline Bitartrate, Dried Whey, Non-fat Dry Milk, Natural Flavor, Silicon Dioxide, Magnesium Stearate, Potassium Chloride, Vitamin E Supplement, Iron Proteinate, Magnesium Oxide, Safflower Oil, Zinc Sulfate, Niacinamide, Vitamin A Supplement, Cobalt Amino Acid Complex, Manganese Sulfate, Riboflavin, D-Calcium Pantothenate, Pyridoxine Hydrochloride, Vitamin D3 Supplement, Thiamine Mononitrate, Copper Oxide, Vitamin B12 Supplement, Biotin.